Indoor bicycle trainers allow you to ride from the comfort of your own home, keeping you safe from hazards of high-traffic roads. While many trainers can be expensive, there are some affordable trainers on the market that offer comfort and on-the-road feel. You can switch resistance up or down depending on your needs, and you can choose between actual stationary bikes or trainers built for regular bikes. 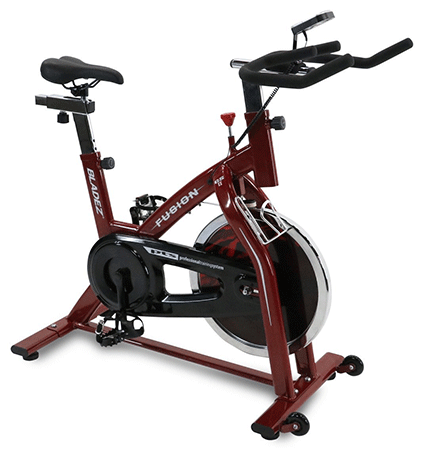 If you are looking for an indoor trainer, you will want to find a bike that has a solidly-crafted steel frame, a chain drive (though some belt drives can be just as effective in giving smooth rides), and a fully-adjustable handlebar, seat, and resistance system. Electronics aren’t necessarily included on all bikes since you can buy your own monitors. You will want to look for bikes that have swap-able seats and pedals, and trainers should be able to fit your bike’s wheel size. 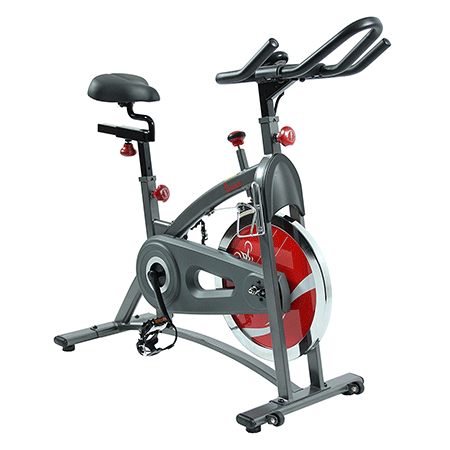 The Bladez Fitness Fusion GS II features fully adjustable handlebars and has a sleek red-and-black design that with a four-way adjustable Sport seat. The bike has a 40-lb, 17″ diameter flywheel and an LCD monitor that shows distance, total distance, speed, time, and calories burned. This 85-lb bike has dimensions of 47.5 x 20 x 43 inches. 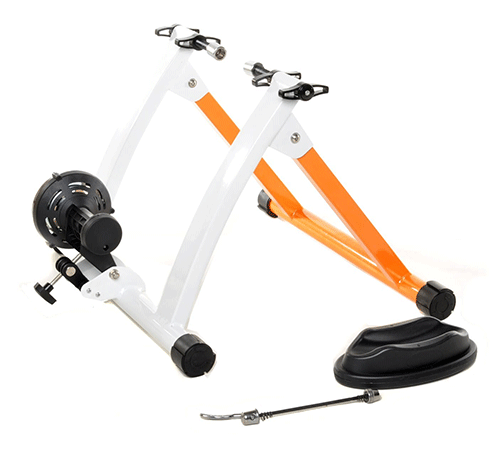 The 3-Piece pedal crank system lends extra durability to the bike. 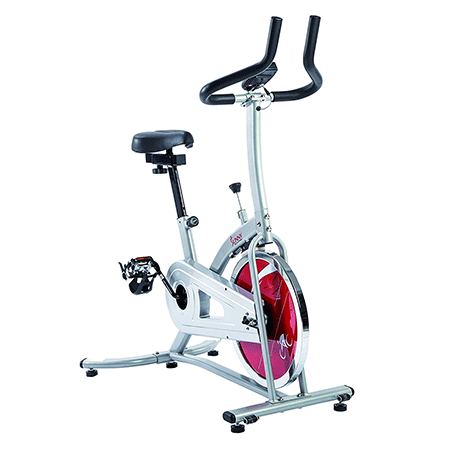 The Belt Drive Indoor Cycling Bike is comfortable and easy-to-store. This bike comes with a heavy-duty 40-lb flywheel gives a smooth, quiet ride that rivals some $600-and-over bikes. The bike has a four-way adjustable seat, height adjustable handlebars, an easy-to-use LCD screen, and a conveniently-placed water bottle holder. When assembled, the bike’s dimensions are 47″L X 20″W X 44″H, and it can hold up to 250 lbs. This trainer replicates the road-riding experience with its array of workout options. It also features a precision-calibrated fluid resistance that gives you the feeling of being on the road. 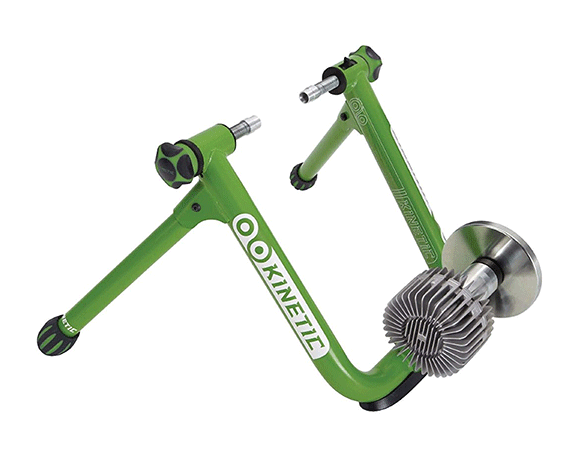 The Road Machine 2.0 is compatible with Kinetic inRide Watt Meter, and the frame fits bikes with wheels between 22″ and 29″. This trainer is a conveniently small size (product dimensions are 81.3 x 56.9 x 40.6 cm). If you crave versatility, the SF-B1110 offers a solid steel frame and a highly-adjustable handlebar, seat, and resistance. This bike has a 44-lb flywheel, which is somewhat heavier than standard. 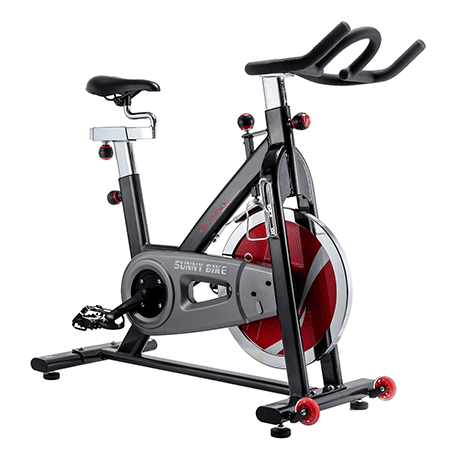 The SF-B1110 is a chain drive bike with a 44-lb flywheel with felt pad resistance, giving it a noiseless ride. The bike’s dimensions are 44 x 20 x 44.5 cm. 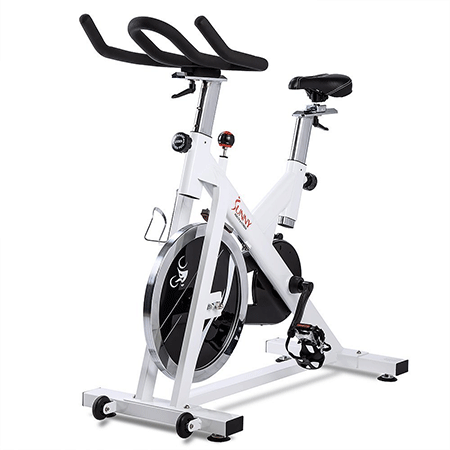 If you’re looking for a trainer that gives you the feel of actually peddling on the road, this trainer allows you to select between seven resistance levels and can enjoy a quiet and stable ride. This trainer comes with an 850-gram machinated steel flywheel and raised block to keep your wheel locked into place. Also, this trainer is easy to carry and store at only 22.5 lbs and a dimension of 15.25 x 21.5 x 18.75 in. This belt transmission bike gives a quiet ride with its 49-lb flywheel. The seat, handlebar, and resistance are highly adjustable. The frame and crank are made of heavy-duty materials, and the bike can be easily moved due to its portability wheels. The 49-lb chromed solid flywheel features felt pads that provide pressure resistance. The SF-B1002 can hold up to 275 lbs and has a dimension of 50 x 20 x 47 inches. 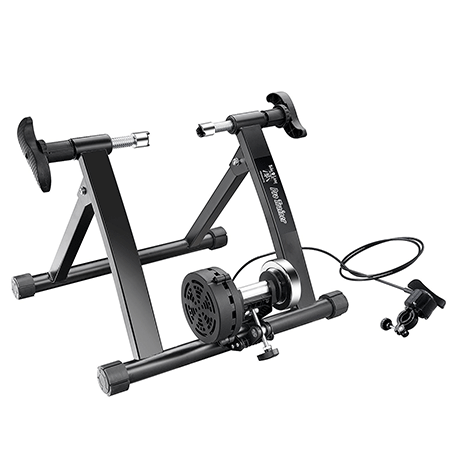 Affordable and heavy-duty, the Conquer trainer is a lightweight at only 16.2 lbs. You can easily store and carry this trainer, although you should be prepared for a bit of noise if you set the resistance up fairly high. The Conquer is just 22.8 x 19.1 x 8.6 inches, and it works with 26-inch, 27-inch and 700c bikes with rear quick release wheels. It comes with a front wheel riser block, mounting cups, and has progressive magnetic resistance. 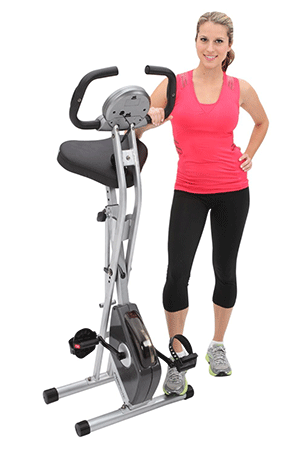 This trainer is affordable and easy-to-use. Its LCD screen is intuitive, and there is a lot of resistance variance. The seat and handlebar are also fully adjustable, but you cannot swap out the seat. This bike is a mere 61 lbs and is 32L x 22W x 45H inches. It has a 22-lb chrome flywheel and felt fabric brakepad. The SF-B901 is a solidly-built, fully-adjustable bike that fits most riders and offers a quiet ride with its 40-lb flywheel and felt pads. This bike is 97 lbs and is 49L x 20W x 47H inches. It has a heavy-duty crank system and features a comfortable leather padded seat. This Expeutic fits anyone between 5’3″ and 6’1″ and offers immense comfort. It is compact and easy-to-store since it folds to half its size and has transportation wheels. Additionally, the Expeutic features an 8-level magnetic tension control system, hand pulse sensors, and a 3-piece crank system. It is 22L x 20W x 55.5H inches and weighs just 42.8 lbs. Each of these trainers offers something different, and there is a range of affordable prices. You don’t have to spend hundreds of dollars to get a good bicycle trainer, but you should expect to spend a little bit of extra money on swapping or adding equipment to your trainer.